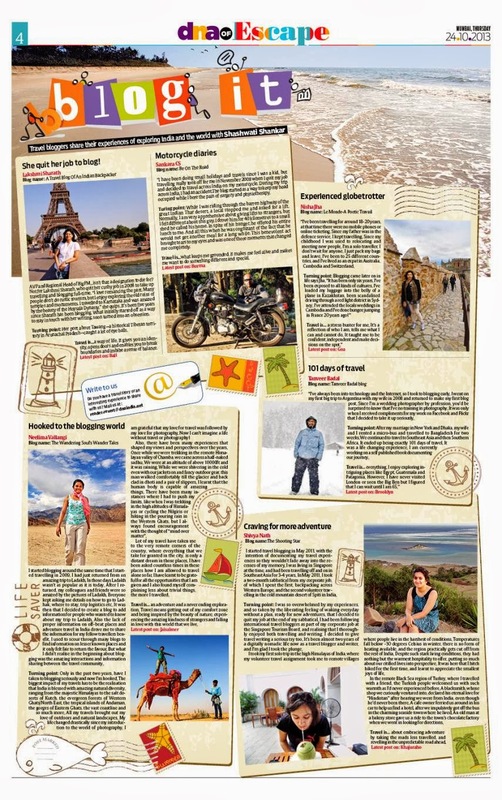 Featured in DNA Newspaper - Be On The Road | Live your Travel Dream! It gives me great pleasure to inform you that I have been featured in today’s edition (Oct 24, 2013) of the DNA Newspaper, Mumbai edition. The article is titled ‘Blog It’ and it is in the DNA of Escape section. This article written by Shashwati Shankar talks about travel bloggers who share their experiences of exploring India and the world. There are five other awesome travel bloggers in this article with me and each one of us share our passion for travel and blogging and answer the important question of ‘why we travel?’. I recommend you follow those 5 travel bloggers too as they each of them travel voraciously, click amazing photographs and write great stories. Have you read this article in today’s newspaper? Below are screenshots of my profile in that article. For the full article, where you can read the entire story along with profiles of the other 5 travel bloggers.